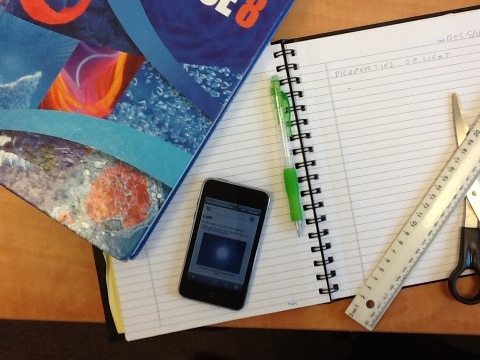 A glance at the student’s desk tells it all: scissors, ruler, paper, textbook, iPod. All the basic learning tools. The students come into class and take their seats, the iPod untouched until the teacher gives direction. Several years ago, Joe Morelock’s school district (10 schools) of Canby, Oregon, went out on a limb and bought all the students in the third grade an iPod for classroom use. The focus of the iPod project was improving literacy. You might wonder how a music listening device would help literacy, but the results were impressive (read them at http://wiki.canby.k12.or.us/groups/ipodusergroup/blog/). Joe Morelock presented at SD36’s Digital Discovery Series. Electronic devices can have a variety of educational purposes, and in Canby these devices were used to provide students with individualized feedback on their learning, so that they knew immediately if they were performing the skills correctly, and could make immediate corrections. What is the value of a pencil and paper test of recall of facts, when five seconds after the test is collected a Google search will provide more information than the test could require? What is the value of an individual assessment when employers are looking for graduates who can work together to achieve a goal? What is the value of having 29 students wait while one puts up their hand for the teacher to confirm or correct their response? What is the value of all students proceeding at the same pace when some already understand the concept and others are missing essential knowledge foundations? The interesting thing about these questions is that while only one references technology directly (Google), they have all become important at least indirectly because of technological change. As educators, finding ways to lead students in new ways of learning that we are only just understanding ourselves is one of our great contemporary challenges. Love your post. I want to buy iPods too. They are a great device for group work and pretty cheap too. I too was impressed with them findings in Canby school district. The ipods were really making a difference. Love your blog. Thanks for the comment and feedback. The iPods are definitely more reasonable in price than the iPads, though it still adds up if you get the accessories for charging and syncing them. The district also has a couple of loaner sets as well through Ed Services. I’m hoping to encourage some of our teachers to try them out!